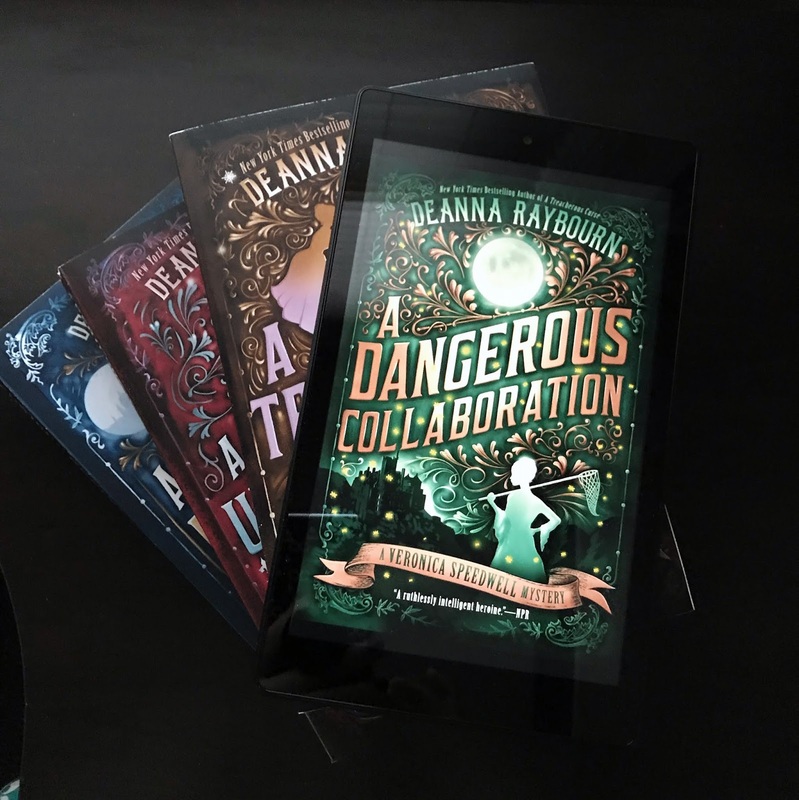 A few months back I gushed all about how much I love the Veronica Speedwell series by Deanna Raybourn. From the moment I read it, it quickly became one of my favorite series of all time, so needless to say, the latest installment was my most anticipated release of this year. I'm so happy to say, it did not disappoint! A quick little recap of the series: It takes place in Victorian England and follows Veronica Speedwell, a fiercely independent lepidoptrist (someone who studies butterflies), and the adventures her and her dashingly broody natural historian companion Stoker often get wrapped up in. The two use their scientific minds to help solve mysteries with a good ol' helping of sass and sexual tension thrown in for good measure. Seriously, this is one of my favorite fictional relationships but the slow burn of it kills me. A Dangerous Collaboration starts with Veronica being whisked away to a house party on a remote island by Lord Tiberius Templeton-Vane, Stoker's arrogant older brother, after he calls in a favor of her. Much to Stoker's annoyance, Tiberius also persuades Veronica to pose as his fiancé, which leads him to jealously join in their journey to Lord Malcolm Romilly's castle. What the trio find once arriving isn't your typical party-- Lord Romilly has gathered everyone who had a connection with his missing wife, who disappeared on their wedding night three years earlier, and he means to find out what happened to her. Once ghostly run-ins, mysterious happenings and disappearances start cropping up, Veronica and Stoker take it upon themselves to get to the bottom of whatever is truly haunting the castle walls. Their investigation takes them all over the island, from the pubs filled with superstitious locals to hidden passageways within the castle itself. As they delve deeper into the mystery, they soon discover that all is not as it seems at Romilly castle and every person there has a motive for murder. I enjoyed how you really just jump right into the adventure this time around. As always, the mystery itself was entertaining, though it wasn't my favorite of the series so far. The banter between Veronica and Stoker still remains the highlight for me. Their mutual respect for one another is so touching, and their interactions are so witty; they know what buttons to press and never miss an opportunity to do so. That being said, I felt a little off at the start of this one because their relationship was unlike it's ever been-- they had just spent six months apart and were acting indifferent towards one another due to events from the last book. Luckily, Raybourn more than made up for it once they got to the island and really fanned than slow burn. Not only do we get cheeky flirting, we finally get a swoon-worthy declaration of love and it was ev-ery-thing. I also liked learning more about Tiberius and his backstory. It made you feel a bit more than just annoyance towards him. Also, if it weren't for him I don't think Stoker would've admitted his feelings for Veronica, so he's alright for now in my book. So, even though this mystery didn't engage me as much as the others, overall I really enjoyed this book. It was one of those where after I finished, I went back and re-read all my favorite parts. The ending, which sets up the next mystery Veronica and Stoker will be tackling, is so exciting and I absolutely can't wait for it. Someone please give me a movie or Netflix adaptation of this series because I need it.